A long ago decommissioned railway bridge just north of the Kildonan Park, which is of the same type as the still used Redwood bridge. The central revolving part of this abandoned railway bridge is permanently open and positioned in the direction of the river current. 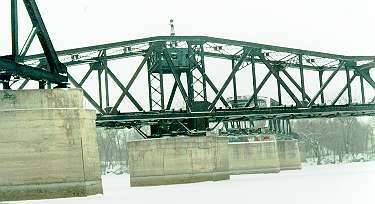 Here is a close-up of the open revolving span of that bridge showing the engine room high above the central pilar. In their age these bridges must have been a marvel of technology. This place is in the middle of the river just south of the above bridge. It is one end of a skating trail about half a kilometer long, winding along the centre line of the river between two parks on the two opposite sides of the Red River. The trees that you can see are the discarded Christmas trees used by the Winnipeg City Parks staff to decorate the river skating trails, and to create along them little shelters from the wind. All the pictures on this page were taken on Sunday Jan. 11, 1998 after two days of rather heavy snowfall at the beginning of another snowstorm (at -20°C). That is why the skating trail was completely hidden under the snow and good for skiing only, waiting to be cleared by the Parks crew on Monday. And this is one of the Winnipeg's newer bridges, the Kildonan Bridge. Although just north of the old railway bridge in the first picture above, it is barely visible in that picture as it was hidden behind the curtain of the falling snow. 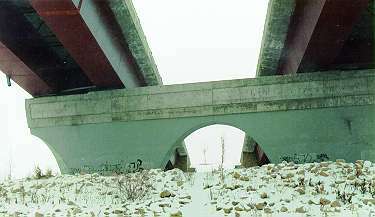 And this is an uncommon view from the river ice under the Kildonan Bridge into the snow-spilling sky.